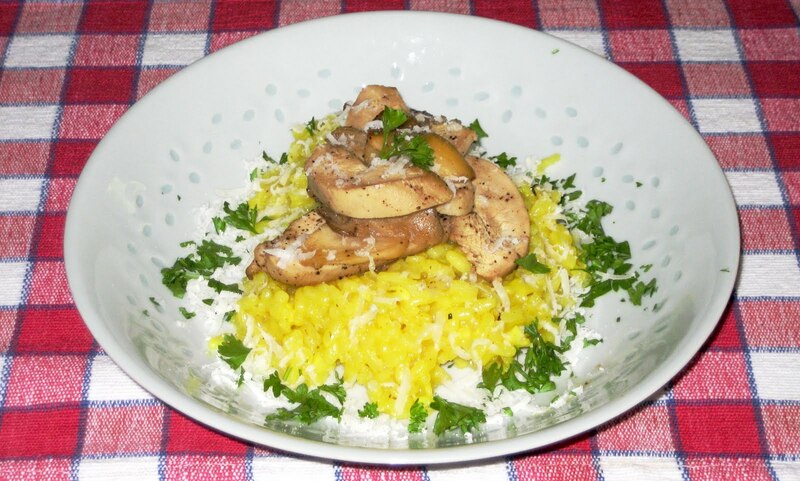 Last few days I had craving for nice creamy risotto so I checked my posts to see what kind I cooked last time. I was very surprised that I didn’t post any regular rise risotto recipe, none at all! Risotto is so versatile. You can prepare it with so many different meats and vegetables and mix them right in risotto at the end of cooking or serve them on top. Since I bought King Oyster Mushrooms and farm fresh chicken breasts I wanted to use these two ingredients as a main topping. I just love these mushrooms for their taste and texture. Also, since I do have saffron on hand at all times, the risotto I have made was classical “Risotto alla Milanese”. Heat 1 tsp. of oil and 1 Tbs. of butter in skillet. Add mushrooms and toss to coat all slices. Cook till mushrooms show nice color (do not move them too much). When done, remove to bowl and keep warm. Preheat oven or toaster-oven to 375 °F. In the same skillet where you cooked mushrooms, add 1 Tbs. butter and 1 tsp. oil and cook chicken breast for about 3 minutes on each side or until both sides are golden brown. Sprinkle both sides with salt and pepper, place in baking dish (I use steel pie plate) and roast in oven for about 15 minutes or till juices run clear when pierced with sharp pointed knife. Do not overcook! Remove from oven, cover with foil and let the breasts rest but keep warm. In the same skillet that you cooked mushrooms and chicken, sauté shallots and garlic in remaining butter and oil until shallots are translucent. Add the rice and stir until the rice turns opaque, about two minutes. Add the wine to the rice and stir frequently until the wine has been absorbed into the rice. Add 1/2 cup of the heated chicken stock and stir until absorbed. The rice and stock should bubble gently. Continue to cook the rice, adding chicken stock 1/2 cup at a time and allowing the rice to absorb it before adding the next 1/2 cup. Taste for seasoning and adjust. Cook rice until al dente, about 25-30 minutes. With the addition of last batch of stock add the grated parmesan cheese and 2 Tbs. of butter and stir thoroughly. Remove from heat when the risotto is thick and creamy. Serve on pre-heated plate or bowl, top with mushrooms and slices of chicken breast and garnish with freshly grated Parmigiano and parsley.